Large duplex luxury holiday apartment for 8 persons within the 5 star Hotel Rumaykiyya in the upper zone of the ski station Sierra Nevada. The slopes and a chair lift are 15m next to the building. You can put on your skis right infront of your accommodation. 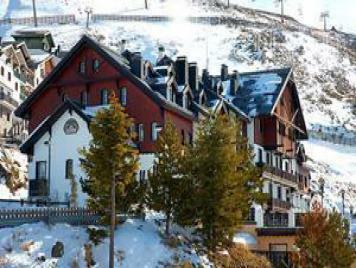 The Hotel Rumaykiyya is the only 5 star hotel in the Sierra Nevada. It offers a fine restaurant, cafeteria, spa and wellness area (to be paid extra), kids playzone, terraces, wifi internet and much more. The holiday apartment as well as the hotel are equipped and decorated with great taste and of high quailty. The TV can receive Canal Plus and foreign channels. The price includes a covered parking with elevator within the hotel and a ski storage room for skis and boots.